JFS has a contract to continue resettlement work with HIAS during the Federal Fiscal Year 2019, and we are increasing economic, social and civic integration services to our newest neighbors. Tiny, children’s shoes are side-by-side between the front door and garage. A small red and yellow circus tent, big enough for a toddler or two, stands in the living room off the kitchen of the Bellevue townhome. Albert* and Alisa’s* three young children are not the only reason they decided to leave Russia and seek refuge in the U.S., although dreams of a better future for their family finally pulled them to re-establish their lives. The Russian political climate had been creating a festering hatred for years alongside lingering anti-Semitism. Could their Jewish daughters easily become scapegoats without any legal protection? Would they watch other friends and neighbors be targets of the rising frustrations? There were, of course, other issues that began to add up as well, like wanting to give their children Jewish names. They had decided against it for their first born at the suggestion of friends and family. After all, there were blatant anti-Semitic remarks made at their expense as part of the small remaining Jewish community in Russia. A mass exodus of Jews from the Former Soviet Union happened during the late 1980s and early 1990s, leaving few Jews left in the country. After the birth of Albert and Alisa’s second child, they decided it was finally time. They gave the child a Jewish name and applied for refugee status. The decision was not an easy one. Alisa worked in law, and Albert in information technology. They were financially stable. While Alisa’s sister lives in the Seattle area, most of their family and friends live in Russia. 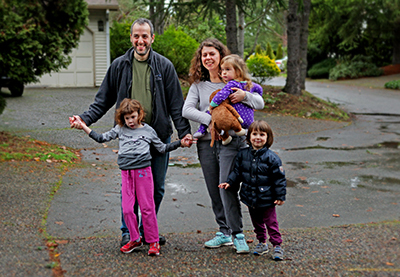 They wondered about what help they would find in the U.S.
Much to their relief, Jewish Family Service provides support for refugees from the moment they are assigned to the agency through citizenship. To achieve this, JFS helps individuals and families toward finding meaningful work to support themselves and their families. Cultural orientation classes provide insight into American social norms and how to navigate local systems, such as transportation and schools, that can vary greatly from other countries. JFS also offers English as a Second Language (ESL) classes, immigration assistance and citizenship classes. Her husband echoed her sentiment and appreciation. “Without Julie and JFS, I don’t know how we’d handle it,” he said. JFS staff not only set up the family’s new home with furnishings before they arrived, there is also continued support with helping them navigate the health care system, schools, local community and employment options. Resettlement Case Manager Julie Patt is providing intensive case management because of the family’s medical needs. The program is designed to support refugees who might face more barriers to self-sufficiency than others. “They have repeatedly impressed me with their readiness to take on whatever obstacles they find in supporting their family,” Julie said. After being in the U.S. for only a few months, Alisa is looking to volunteer as a court appointed special advocate. In the meantime, she is working with a JFS Employment Case Manager to find a way back into her professional field as a paralegal or legal assistant. One day, she hopes to practice law again. Albert found a job in his field through his own connections in the area. It was a quick and impressive accomplishment that not all newly resettled community members experience. Their two youngest now go to a Russian-speaking daycare, and their oldest is in a special education program at a public school. The second oldest is also enrolled in Sunday religious school. The family joined the congregation Alisa’s sister attends, continuing their Jewish education and practice in the U.S. Eventually, Alisa wants to enroll their daughters in a Jewish school — if they can find one within their budget. And, someday, Alisa hopes they will all become U.S. citizens, gaining the right to vote and opening the world to them in ways only U.S. citizenship can. “You can move freely,” she said, knowing there is a certain amount security that comes with citizenship. It is that sense of security and belonging that a young Russian child with a Jewish name might not otherwise have.